How do you defeat a magician who can shape mountains? Abbey and her friends travel across the sea in search of Syd's brother, a sailor captured by a warlord years ago. To find him, they'll need the help of their greatest enemy, the Storm Caller Dahlia. When they arrive, they discover a land ruled by a new form of magic: the Way of Stone. The Stone Shapers agree to help Abbey and her friends track down the missing man, but only if Abbey helps them defeat a band of rebels first. What Abbey doesn't know is that the leader of the rebels is the very man they came to rescue. Storm Breakers is a fun, swashbuckling romp filled with twists, adventure, and plenty of banter. 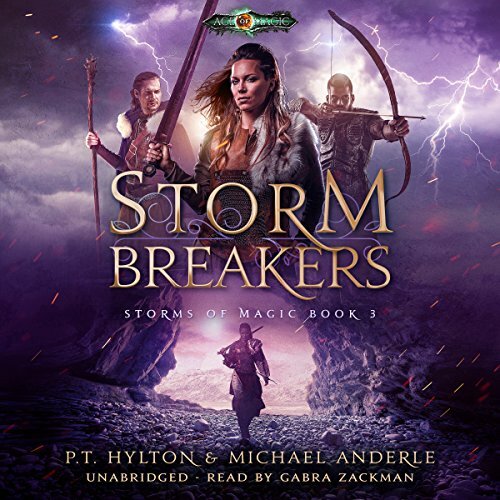 Set on the foundation laid by the Kurtherian Gambit Series, Storm Breakers tells an entirely new story in the Age of Magic - and of the heroes and villains who battle for control of its destiny. I'm going to be totally honest I absolutely hate leaving reviews. I only do it for the best books so the fact that I keep leaving reviews for any books in the aetherium Gambit series should say that they're all worth reading. as per the usual this book was awesome I listened all the way to the end and didn't even stop to eat. in hindsight that was a mistake now I'm starving LOL I'm just kidding but I did listen to the entire book with rapt attention Dalia the Stark raving lunatic may she rest in torment. I say good riddance to bad rubbish call yourself a queen please. if every woman that call themselves a queen was one we have a lot of problems in this world. So wait we already do Michael PT thank you Gabra awesome job as I said above thank each and every one of the members that helped this come to pass because I love this book I can't wait to hear book 4. This is a great series. I love watching the characters develop. Love watching the magic develop. There is also plenty of action. Abby and the gang are in search of Eli. Little do they know the danger the team faces from the magic users wielding stone. The team overcomes obstacles at every turn. Looking forward to the next story. The narrator did a great job.